Once you try these Mini S'mores Stacks, you won't feel like a campfire is complete without them! Whip them up with the kids for a fun, nostalgic treat to go with your next fireside chat. If you’ve opted to create your own marshmallow cream (which we encourage!) start with a small saucepan, fitted with a candy thermometer, and bring the water, corn syrup and 3/4 cup sugar to 246° F.
While that’s heating up, whisk the egg whites, salt and cream of tartar in a dry mixing bowl for about 2 minutes, or until its creamy and foamy. As you whisk, sprinkle in the extra tablespoon of sugar and mix for about 2 more minutes. To ensure you get just the right amount of creaminess in your marshmallow cream, keep mixing at a slow speed and gradually start drizzling in the hot syrup. Once it’s all been added, turn up the mixer (or speed up your whisking if using a regular whisk) and mix for about 7 minutes, or until the cream has a thick and fluffy consistency. Slow the mixer down (regardless of whether it’s man or machine!) and whisk in the vanilla extract to complete the cream. Set aside and grab the Mini Pancakes. Place 8 of the warm Mini Pancakes on a plate and top each with marshmallow cream. Grab a few milk chocolate chips and sprinkle them on top. 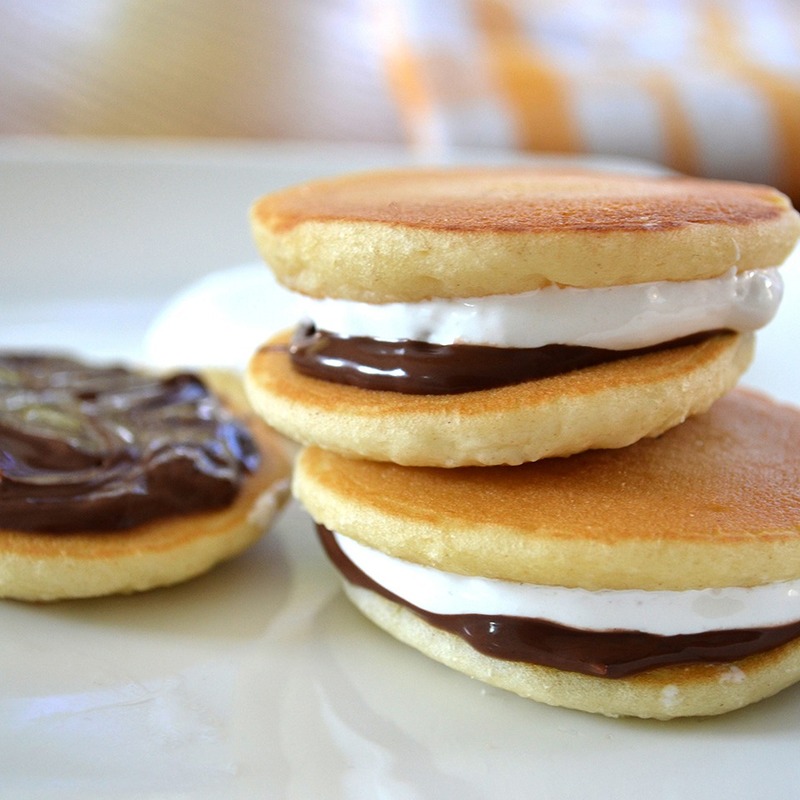 Add a bit more cream if you wish, then top off with another Mini Pancake to complete your S’mores! Finally, pass them around the campfire and enjoy! Chef's Tip: Make ahead, wrap and freeze. These also make a great frozen treat!